let me just start off by saying that every part of this past weekend was heaven. it was our first weekend in our montauk house! our days were spent on the beach and our nights by the grill. we grilled tons of fresh veggies that we picked up from a local road stand and made loads of guacamole. 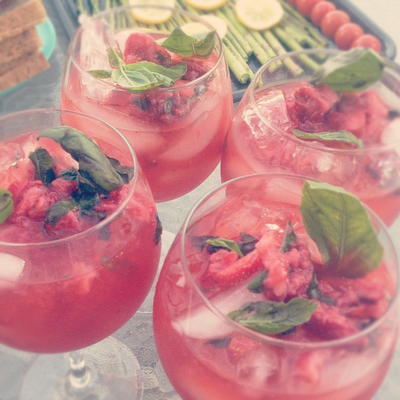 best of all, we dressed up our jose cuervo with muddled strawberries and basil. don't get me wrong...we love a margarita, but this was a tasty change! in a large pitcher, toss in strawberries, basil, lime juice, and sugar. muddle with a large spoon until pasty. add tequila and ice and stir. top off with bottle of wine or champagne and mix well.